PESHAWAR, Pakistan , Nov 6 2014 (IPS) - Residents of the Khyber Agency, one of seven administrative districts that comprise northern Pakistan’s Federally Administered Tribal Areas (FATA), are in the worst possible predicament: either course of action they choose now, they say, could result in death. As Pakistan’s military offensive against the Tehreek-e-Taliban Pakistan (TTP) expands slowly from North Waziristan Agency to the restive Khyber Province, civilians must decide whether or not to defy a Taliban ban on travel. If they stay, they risk becoming victims of army shelling and gunfire, aimed at rooting out terrorists from the Afghan-Pakistan border regions where they have operated with impunity since 2001. If residents attempt to flee, they will face the wrath of militants who rely on the civilian population to provide cover against a wholesale military bombardment of the region. At the end of October, members of the TTP issued a warning to local residents that their houses would be blown up if they followed the army’s evacuation orders, which came in the form of pamphlets dropped from helicopters ahead of a three-day deadline to militants to lay down their arms or face a major offensive. Literally caught between the devil and the deep blue sea, some residents have chosen to heed the Taliban’s threat, while others are risking life and limb to escape the embattled zone and find refuge in safer areas. Zahir Afridi, a resident of the Tirah locality in Khyber Agency, recently escaped to the Jallozai refugee camp located 35 km southeast of FATA’s capital, Peshawar, by pretending that his two-year-old daughter had fallen ill and was in urgent need of medical treatment. “The Taliban allowed us [to leave] on the condition that we would return after Begum [his daughter]’s recovery, but actually we cannot return for fear of our lives,” he tells IPS. Experts say that civilians act as a kind of “human shield” for the militants, who would otherwise be isolated and vulnerable to attack. Dr. Khadim Hussain, chairman of the Bacha Khan Trust Education Foundation (BKTEF), an organisation that promotes peace, democracy and human rights, tells IPS that keeping civilians trapped in a war zone is a “well established and successful strategy employed by militants” to escape the full force of military campaigns. The use of human shields is nothing new either. Shams Rehman, a political analyst at the Government College, Peshawar, tells IPS that militants successfully used local residents as human shields in the Swat district of the northern Khyber Pakhtunkhwa (KP) province, which they ruled from 2007 to 2009. “Though the army started operations in Swat in 2009 [they] couldn’t get the desired results because the Taliban was using residents” to protect them from an all-out offensive, he says. It was not until early 2010 that the government decided to issue a mass evacuation alert to the population – warning them to take shelter in camps in the nearby Mardan district – before launching a major military operation. In this way, “the government isolated the militants and defeated them,” Rehman explains. It is this same model that the government is now following in North Waziristan, where, over the last 10 years, members of the TPP and Al Qaeda have established a robust base from which to plan and execute their activities. For many years the government could do nothing about the presence of this unofficial ‘headquarters’ due to the large civilian population living amongst the terrorists. Mushtaq Khan of the Jamaat-e-Islami party says that now, with nearly 18.9 percent of land in North Waziristan cleared of all residents, the government is doing what it could not for the past decade: inundate the area with firepower in a bid to completely flush out all the militants. The campaign, which began on Jun. 15, has so far resulted in the displacement of over 500,000 residents, who are now living in camps in the neighbouring KP province. 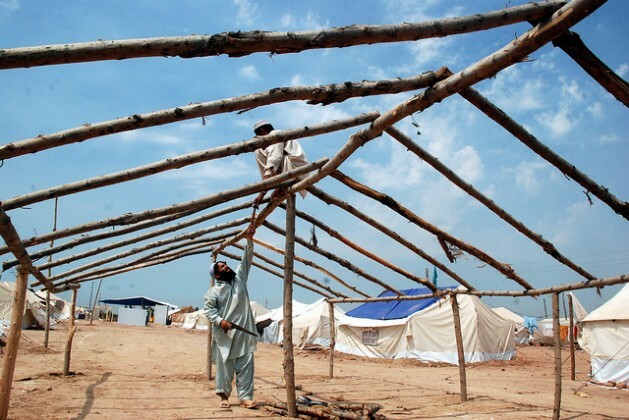 The journey to the sprawling ‘tent cities’ erected for IDPs in towns like Bannu was not easy. Some died along the way, after trudging for hours in a summer heat wave that at times touched 45 degrees Celsius. Many were separated from their families en route. Those who made it safely to Bannu might have been considered the lucky ones – that is, until it became evident that the living conditions in the camps were abysmal, with food shortages, a near-total absence of clean water sources and sanitation facilities, and limited medical personnel and supplies. Now, residents of the Khyber Agency are facing a similar plight. Muhammad Shad, who recently reached Peshawar along with his 12-member family, claims he and his clan walked for five hours before finding a vehicle that would carry them safely to the capital. “The situation was extremely bad; all of us felt threatened,” the 55-year-old daily wage labourer tells IPS from the Jallozai camp, where he now lives, adding that scores of his friends and neighbours are still being “held hostage” by the Taliban. He explains that threats from militants are not empty words. To prove this, the TTP set 20 houses in Khyber Agency ablaze on Aug. 14; they belonged to former militants who had handed their weapons over to the army. Despite these terror tactics, residents continue to flee en masse – with some 95,000 making it out of Khyber Agency – willing to risk retribution for a chance to live free of the militants’ control. “Life under the Taliban was not easy,” says Shahabuddin Khan, a resident of South Waziristan Agency, who migrated to Peshawar two months ago along with his family, after having faced violence, threats and intimidation by militants. In total, over a million people have been uprooted from their homes in northern Pakistan, forced to flee from one province to another in search of a normal life. Military spokesman Asim Bajwa tells IPS that “decisive action” on the part of the government has enabled them to clear certain areas of militants, thus allowing people to live peacefully. “The people should cooperate with the army so they [the militants] are defeated forever,” he asserts.